Recent Arrival! 26/35 City/Highway MPG. Back-Up Camera, Toyota Safety Sense 2.0: Pre-Collision Sys w/Pedestrian Detection, Full-Speed Range Dynamic Radar Cruise Control, Lane Departure Alert w/Steering Assist, Lane Tracing Assist, Automatic High Beams, Road Sign Assist. TOYOTA NEW VEHICLE WARRANTY: Every Toyota vehicle is supported by a 36-month/36,000-mile limited warranty coverage, Powertrain Coverage for 60 months/60,000 miles (engine, transmission/transaxle, front-wheel-drive system, rear-wheel drive, seatbelts and airbags) and Rust-Through Coverage of 60 months/unlimited miles (corrosion perforation of sheet metal)." WHY BUY FROM ANDERSON: Anderson Toyota is a five-time recipient of the Toyota President's Award. The award is given to dealers that excel in all facets of their operations and is recognition for dealerships that continue to go above and beyond at each customer touch point and represent the best of the best. The Anderson Auto Group is a one stop auto sales, maintenance, and repair business for all of your automotive needs. Out of town customers will be accommodated with free shuttle service from Las Vegas and Phoenix airports and if an overnight stay is needed, discounted nightly rates are available from local hotels. We welcome you to come in and enjoy a positive buying experience and look forward to you joining the Anderson family of customers. DISCLAIMER: Prices, options, specifications and images shown are subject to certain qualifications and availability. Pricing information is not final and may not include taxes, registration, finance and purchase fees. Please confirm vehicle availability, pricing and warranty information by calling us at 928-764-2886 or emailing our internet sales department at toyotasales@andersonauto.com. Recent Arrival! 26/35 City/Highway MPG. Back-Up Camera, Toyota Safety Sense: Pre-Collision Sys w/Pedestrian Detection, Full-Speed Range Dynamic Radar Cruise Control, Lane Departure Alert w/Steering Assist, Lane Tracing Assist, Automatic High Beams, Road Sign Assist. TOYOTA NEW VEHICLE WARRANTY: Every Toyota vehicle is supported by a 36-month/36,000-mile limited warranty coverage, Powertrain Coverage for 60 months/60,000 miles (engine, transmission/transaxle, front-wheel-drive system, rear-wheel drive, seatbelts and airbags) and Rust-Through Coverage of 60 months/unlimited miles (corrosion perforation of sheet metal)." WHY BUY FROM ANDERSON: Anderson Toyota is a five-time recipient of the Toyota President's Award. The award is given to dealers that excel in all facets of their operations and is recognition for dealerships that continue to go above and beyond at each customer touch point and represent the best of the best. The Anderson Auto Group is a one stop auto sales, maintenance, and repair business for all of your automotive needs. Out of town customers will be accommodated with free shuttle service from Las Vegas and Phoenix airports and if an overnight stay is needed, discounted nightly rates are available from local hotels. We welcome you to come in and enjoy a positive buying experience and look forward to you joining the Anderson family of customers. DISCLAIMER: Prices, options, specifications and images shown are subject to certain qualifications and availability. Pricing information is not final and may not include taxes, registration, finance and purchase fees. Please confirm vehicle availability, pricing and warranty information by calling us at 928-764-2886 or emailing our internet sales department at toyotasales@andersonauto.com. Recent Arrival! 25/33 City/Highway MPG. Back-Up Camera, Toyota Safety Sense 2.0: Pre-Collision Sys w/Pedestrian Detection, Full-Speed Range Dynamic Radar Cruise Control, Lane Departure Alert w/Steering Assist, Lane Tracing Assist, Automatic High Beams, Road Sign Assist. TOYOTA NEW VEHICLE WARRANTY: Every Toyota vehicle is supported by a 36-month/36,000-mile limited warranty coverage, Powertrain Coverage for 60 months/60,000 miles (engine, transmission/transaxle, front-wheel-drive system, rear-wheel drive, seatbelts and airbags) and Rust-Through Coverage of 60 months/unlimited miles (corrosion perforation of sheet metal)." WHY BUY FROM ANDERSON: Anderson Toyota is a five-time recipient of the Toyota President's Award. The award is given to dealers that excel in all facets of their operations and is recognition for dealerships that continue to go above and beyond at each customer touch point and represent the best of the best. The Anderson Auto Group is a one stop auto sales, maintenance, and repair business for all of your automotive needs. Out of town customers will be accommodated with free shuttle service from Las Vegas and Phoenix airports and if an overnight stay is needed, discounted nightly rates are available from local hotels. We welcome you to come in and enjoy a positive buying experience and look forward to you joining the Anderson family of customers. DISCLAIMER: Prices, options, specifications and images shown are subject to certain qualifications and availability. Pricing information is not final and may not include taxes, registration, finance and purchase fees. Please confirm vehicle availability, pricing and warranty information by calling us at 928-764-2886 or emailing our internet sales department at toyotasales@andersonauto.com. Recent Arrival! 26/35 City/Highway MPG. Back-Up Camera, Toyota Safety Sense: Pre-Collision Sys w/Pedestrian Detection, Full-Speed Range Dynamic Radar Cruise Control, Lane Departure Alert w/Steering Assist, Lane Tracing Assist, Automatic High Beams, Road Sign Assist Star. TOYOTA NEW VEHICLE WARRANTY: Every Toyota vehicle is supported by a 36-month/36,000-mile limited warranty coverage, Powertrain Coverage for 60 months/60,000 miles (engine, transmission/transaxle, front-wheel-drive system, rear-wheel drive, seatbelts and airbags) and Rust-Through Coverage of 60 months/unlimited miles (corrosion perforation of sheet metal)." WHY BUY FROM ANDERSON: Anderson Toyota is a five-time recipient of the Toyota President's Award. The award is given to dealers that excel in all facets of their operations and is recognition for dealerships that continue to go above and beyond at each customer touch point and represent the best of the best. The Anderson Auto Group is a one stop auto sales, maintenance, and repair business for all of your automotive needs. Out of town customers will be accommodated with free shuttle service from Las Vegas and Phoenix airports and if an overnight stay is needed, discounted nightly rates are available from local hotels. We welcome you to come in and enjoy a positive buying experience and look forward to you joining the Anderson family of customers. DISCLAIMER: Prices, options, specifications and images shown are subject to certain qualifications and availability. Pricing information is not final and may not include taxes, registration, finance and purchase fees. Please confirm vehicle availability, pricing and warranty information by calling us at 928-764-2886 or emailing our internet sales department at toyotasales@andersonauto.com. Recent Arrival! 25/33 City/Highway MPG. XLE Convenience Package: 8-way Power-Adjustable Driver's Seat with Lumbar Support, Heated Front Seats, and Height-Adjustable Power Liftgate with Jam Protection. XLE Weather Package. TOYOTA NEW VEHICLE WARRANTY: Every Toyota vehicle is supported by a 36-month/36,000-mile limited warranty coverage, Powertrain Coverage for 60 months/60,000 miles (engine, transmission/transaxle, front-wheel-drive system, rear-wheel drive, seatbelts and airbags) and Rust-Through Coverage of 60 months/unlimited miles (corrosion perforation of sheet metal)." WHY BUY FROM ANDERSON: Anderson Toyota is a five-time recipient of the Toyota President's Award. The award is given to dealers that excel in all facets of their operations and is recognition for dealerships that continue to go above and beyond at each customer touch point and represent the best of the best. The Anderson Auto Group is a one stop auto sales, maintenance, and repair business for all of your automotive needs. Out of town customers will be accommodated with free shuttle service from Las Vegas and Phoenix airports and if an overnight stay is needed, discounted nightly rates are available from local hotels. We welcome you to come in and enjoy a positive buying experience and look forward to you joining the Anderson family of customers. DISCLAIMER: Prices, options, specifications and images shown are subject to certain qualifications and availability. Pricing information is not final and may not include taxes, registration, finance and purchase fees. Please confirm vehicle availability, pricing and warranty information by calling us at 928-764-2886 or emailing our internet sales department at toyotasales@andersonauto.com. Recent Arrival! 26/35 City/Highway MPG. Limited Grade Weather Package, Entune 3.0 Premium Audio,Dynamic Nav & JBL Navigation, Toyota Safety Sense. TOYOTA NEW VEHICLE WARRANTY: Every Toyota vehicle is supported by a 36-month/36,000-mile limited warranty coverage, Powertrain Coverage for 60 months/60,000 miles (engine, transmission/transaxle, front-wheel-drive system, rear-wheel drive, seatbelts and airbags) and Rust-Through Coverage of 60 months/unlimited miles (corrosion perforation of sheet metal)." WHY BUY FROM ANDERSON: Anderson Toyota is a five-time recipient of the Toyota President's Award. The award is given to dealers that excel in all facets of their operations and is recognition for dealerships that continue to go above and beyond at each customer touch point and represent the best of the best. The Anderson Auto Group is a one stop auto sales, maintenance, and repair business for all of your automotive needs. Out of town customers will be accommodated with free shuttle service from Las Vegas and Phoenix airports and if an overnight stay is needed, discounted nightly rates are available from local hotels. We welcome you to come in and enjoy a positive buying experience and look forward to you joining the Anderson family of customers. DISCLAIMER: Prices, options, specifications and images shown are subject to certain qualifications and availability. Pricing information is not final and may not include taxes, registration, finance and purchase fees. Please confirm vehicle availability, pricing and warranty information by calling us at 928-764-2886 or emailing our internet sales department at toyotasales@andersonauto.com. Recent Arrival! 26/35 City/Highway MPG. Limited Grade Weather Package, Entune 3.0 Premium Audio,Dynamic Nav & JBL Navigation, and JBL SiriusXM/Bluetooth stereo, Toyota Safety Sense. TOYOTA NEW VEHICLE WARRANTY: Every Toyota vehicle is supported by a 36-month/36,000-mile limited warranty coverage, Powertrain Coverage for 60 months/60,000 miles (engine, transmission/transaxle, front-wheel-drive system, rear-wheel drive, seatbelts and airbags) and Rust-Through Coverage of 60 months/unlimited miles (corrosion perforation of sheet metal)." WHY BUY FROM ANDERSON: Anderson Toyota is a five-time recipient of the Toyota President's Award. The award is given to dealers that excel in all facets of their operations and is recognition for dealerships that continue to go above and beyond at each customer touch point and represent the best of the best. The Anderson Auto Group is a one stop auto sales, maintenance, and repair business for all of your automotive needs. Out of town customers will be accommodated with free shuttle service from Las Vegas and Phoenix airports and if an overnight stay is needed, discounted nightly rates are available from local hotels. We welcome you to come in and enjoy a positive buying experience and look forward to you joining the Anderson family of customers. DISCLAIMER: Prices, options, specifications and images shown are subject to certain qualifications and availability. Pricing information is not final and may not include taxes, registration, finance and purchase fees. Please confirm vehicle availability, pricing and warranty information by calling us at 928-764-2886 or emailing our internet sales department at toyotasales@andersonauto.com. Recent Arrival! Limited Grade Weather Package, Entune 3.0 Premium Audio,Dynamic Nav & JBL Navigation, and JBL SiriusXM/Bluetooth, Blind Spot Monitor w/RCTA-B, Integrated Back-Up Camera, Toyota Safety Sense 2.0: Pre-Collision Sys w/Pedestrian Detection, Full-Speed Range Dynamic Radar Cruise Control, Lane Departure Alert w/Steering Assist, Lane Tracing Assist, Automatic High Beams, Road Sign Assist. TOYOTA NEW VEHICLE WARRANTY: Every Toyota vehicle is supported by a 36-month/36,000-mile limited warranty coverage, Powertrain Coverage for 60 months/60,000 miles (engine, transmission/transaxle, front-wheel-drive system, rear-wheel drive, seatbelts and airbags) and Rust-Through Coverage of 60 months/unlimited miles (corrosion perforation of sheet metal)." WHY BUY FROM ANDERSON: Anderson Toyota is a five-time recipient of the Toyota President’s Award. The award is given to dealers that excel in all facets of their operations and is recognition for dealerships that continue to go above and beyond at each customer touch point and represent the best of the best. The Anderson Auto Group is a one stop auto sales, maintenance, and repair business for all of your automotive needs. Out of town customers will be accommodated with free shuttle service from Las Vegas and Phoenix airports and if an overnight stay is needed, discounted nightly rates are available from local hotels. We welcome you to come in and enjoy a positive buying experience and look forward to you joining the Anderson family of customers. DISCLAIMER: Prices, options, specifications and images shown are subject to certain qualifications and availability. Pricing information is not final and may not include taxes, registration, finance and purchase fees. Please confirm vehicle availability, pricing and warranty information by calling us at 928-764-2886 or emailing our internet sales department at toyotasales@andersonauto.com. Recent Arrival! 26/35 City/Highway MPG. Limited Grade Weather Package: Includes Heated Steering Wheel, Perforated Heated and Ventilated Front Bucket Seats, Rear Outboard Reclining Passenger Heated Seating with Perforated Inserts, and Rain-Sensing Variable Intermittent Windshield Wipers with De-Icer Function. Moonroof. Entune 3.0 Premium Audio,Dynamic Nav & JBL Navigation, and JBL With Clari-Fi, Blind Spot Monitor, Back-Up Camera. TOYOTA NEW VEHICLE WARRANTY: Every Toyota vehicle is supported by a 36-month/36,000-mile limited warranty coverage, Powertrain Coverage for 60 months/60,000 miles (engine, transmission/transaxle, front-wheel-drive system, rear-wheel drive, seatbelts and airbags) and Rust-Through Coverage of 60 months/unlimited miles (corrosion perforation of sheet metal)." WHY BUY FROM ANDERSON: Anderson Toyota is a five-time recipient of the Toyota President's Award. The award is given to dealers that excel in all facets of their operations and is recognition for dealerships that continue to go above and beyond at each customer touch point and represent the best of the best. The Anderson Auto Group is a one stop auto sales, maintenance, and repair business for all of your automotive needs. Out of town customers will be accommodated with free shuttle service from Las Vegas and Phoenix airports and if an overnight stay is needed, discounted nightly rates are available from local hotels. We welcome you to come in and enjoy a positive buying experience and look forward to you joining the Anderson family of customers. DISCLAIMER: Prices, options, specifications and images shown are subject to certain qualifications and availability. Pricing information is not final and may not include taxes, registration, finance and purchase fees. Please confirm vehicle availability, pricing and warranty information by calling us at 928-764-2886 or emailing our internet sales department at toyotasales@andersonauto.com. Recent Arrival! 26/35 City/Highway MPG. Limited Grade Weather Package, Entune 3.0 Premium Audio,Dynamic Nav & JBL Navigation, and JBL SiriusXM/Bluetooth, Blind Spot Monitor w/RCTA-B, Integrated Back-Up Camera, Toyota Safety Sense 2.0: Pre-Collision Sys w/Pedestrian Detection, Full-Speed Range Dynamic Radar Cruise Control, Lane Departure Alert w/Steering Assist, Lane Tracing Assist, Automatic High Beams, Road Sign Assist. TOYOTA NEW VEHICLE WARRANTY: Every Toyota vehicle is supported by a 36-month/36,000-mile limited warranty coverage, Powertrain Coverage for 60 months/60,000 miles (engine, transmission/transaxle, front-wheel-drive system, rear-wheel drive, seatbelts and airbags) and Rust-Through Coverage of 60 months/unlimited miles (corrosion perforation of sheet metal)." WHY BUY FROM ANDERSON: Anderson Toyota is a five-time recipient of the Toyota President's Award. The award is given to dealers that excel in all facets of their operations and is recognition for dealerships that continue to go above and beyond at each customer touch point and represent the best of the best. The Anderson Auto Group is a one stop auto sales, maintenance, and repair business for all of your automotive needs. Out of town customers will be accommodated with free shuttle service from Las Vegas and Phoenix airports and if an overnight stay is needed, discounted nightly rates are available from local hotels. We welcome you to come in and enjoy a positive buying experience and look forward to you joining the Anderson family of customers. DISCLAIMER: Prices, options, specifications and images shown are subject to certain qualifications and availability. Pricing information is not final and may not include taxes, registration, finance and purchase fees. Please confirm vehicle availability, pricing and warranty information by calling us at 928-764-2886 or emailing our internet sales department at toyotasales@andersonauto.com. Recent Arrival! 25/33 City/Highway MPG. Limited Grade Weather Package: Includes Heated Steering Wheel, Perforated Heated and Ventilated Front Bucket Seats, Rear Outboard Reclining Passenger Heated Seating with Perforated Inserts, and Rain-Sensing Variable Intermittent Windshield Wipers with De-Icer Function. Entune 3.0 Premium Audio,Dynamic Nav & JBL Navigation, and JBL(R) With Clari-Fi, Blind Spot Monitor, Back-Up Camera. TOYOTA NEW VEHICLE WARRANTY: Every Toyota vehicle is supported by a 36-month/36,000-mile limited warranty coverage, Powertrain Coverage for 60 months/60,000 miles (engine, transmission/transaxle, front-wheel-drive system, rear-wheel drive, seatbelts and airbags) and Rust-Through Coverage of 60 months/unlimited miles (corrosion perforation of sheet metal)." WHY BUY FROM ANDERSON: Anderson Toyota is a five-time recipient of the Toyota President's Award. The award is given to dealers that excel in all facets of their operations and is recognition for dealerships that continue to go above and beyond at each customer touch point and represent the best of the best. The Anderson Auto Group is a one stop auto sales, maintenance, and repair business for all of your automotive needs. Out of town customers will be accommodated with free shuttle service from Las Vegas and Phoenix airports and if an overnight stay is needed, discounted nightly rates are available from local hotels. We welcome you to come in and enjoy a positive buying experience and look forward to you joining the Anderson family of customers. DISCLAIMER: Prices, options, specifications and images shown are subject to certain qualifications and availability. Pricing information is not final and may not include taxes, registration, finance and purchase fees. Please confirm vehicle availability, pricing and warranty information by calling us at 928-764-2886 or emailing our internet sales department at toyotasales@andersonauto.com. Recent Arrival! 25/33 City/Highway MPG. Limited Grade Weather Package: Includes Heated Steering Wheel, Perforated Heated and Ventilated Front Bucket Seats, Rear Outboard Reclining Passenger Heated Seating with Perforated Inserts, and Rain-Sensing Variable Intermittent Windshield Wipers with De-Icer Function. Entune 3.0 Premium Audio,Dynamic Nav & JBL Navigation, and JBL(R) With Clari-Fi. Blind Spot Monitor, Back-Up Camera. TOYOTA NEW VEHICLE WARRANTY: Every Toyota vehicle is supported by a 36-month/36,000-mile limited warranty coverage, Powertrain Coverage for 60 months/60,000 miles (engine, transmission/transaxle, front-wheel-drive system, rear-wheel drive, seatbelts and airbags) and Rust-Through Coverage of 60 months/unlimited miles (corrosion perforation of sheet metal)." 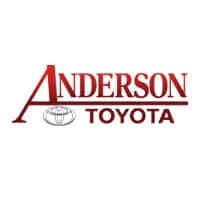 WHY BUY FROM ANDERSON: Anderson Toyota is a five-time recipient of the Toyota President's Award. The award is given to dealers that excel in all facets of their operations and is recognition for dealerships that continue to go above and beyond at each customer touch point and represent the best of the best. The Anderson Auto Group is a one stop auto sales, maintenance, and repair business for all of your automotive needs. Out of town customers will be accommodated with free shuttle service from Las Vegas and Phoenix airports and if an overnight stay is needed, discounted nightly rates are available from local hotels. We welcome you to come in and enjoy a positive buying experience and look forward to you joining the Anderson family of customers. DISCLAIMER: Prices, options, specifications and images shown are subject to certain qualifications and availability. Pricing information is not final and may not include taxes, registration, finance and purchase fees. Please confirm vehicle availability, pricing and warranty information by calling us at 928-764-2886 or emailing our internet sales department at toyotasales@andersonauto.com. Recent Arrival! 25/33 City/Highway MPG. TWO-TONE: BLUE FLAME/ICE EDGE ROOF. Adventure Grade Weather Pkg, Entune 3.0 Premium Audio,Dynamic Navigation, and JBL With Clari-Fi. Moonroof, Toyota Safety Sense. TOYOTA NEW VEHICLE WARRANTY: Every Toyota vehicle is supported by a 36-month/36,000-mile limited warranty coverage, Powertrain Coverage for 60 months/60,000 miles (engine, transmission/transaxle, front-wheel-drive system, rear-wheel drive, seatbelts and airbags) and Rust-Through Coverage of 60 months/unlimited miles (corrosion perforation of sheet metal)." WHY BUY FROM ANDERSON: Anderson Toyota is a five-time recipient of the Toyota President's Award. The award is given to dealers that excel in all facets of their operations and is recognition for dealerships that continue to go above and beyond at each customer touch point and represent the best of the best. The Anderson Auto Group is a one stop auto sales, maintenance, and repair business for all of your automotive needs. Out of town customers will be accommodated with free shuttle service from Las Vegas and Phoenix airports and if an overnight stay is needed, discounted nightly rates are available from local hotels. We welcome you to come in and enjoy a positive buying experience and look forward to you joining the Anderson family of customers. DISCLAIMER: Prices, options, specifications and images shown are subject to certain qualifications and availability. Pricing information is not final and may not include taxes, registration, finance and purchase fees. Please confirm vehicle availability, pricing and warranty information by calling us at 928-764-2886 or emailing our internet sales department at toyotasales@andersonauto.com. Recent Arrival! 25/33 City/Highway MPG. Adventure Grade Technology Package: Intelligent Clearance Sonar with Rear Cross-Traffic Braking, Adventure Grade Weather Pkg, Entune 3.0 Premium Audio, Dynamic Navigation, and JBL premium SiriusXM/Bluetooth stereo. TOYOTA NEW VEHICLE WARRANTY: Every Toyota vehicle is supported by a 36-month/36,000-mile limited warranty coverage, Powertrain Coverage for 60 months/60,000 miles (engine, transmission/transaxle, front-wheel-drive system, rear-wheel drive, seatbelts and airbags) and Rust-Through Coverage of 60 months/unlimited miles (corrosion perforation of sheet metal)." WHY BUY FROM ANDERSON: Anderson Toyota is a five-time recipient of the Toyota President's Award. The award is given to dealers that excel in all facets of their operations and is recognition for dealerships that continue to go above and beyond at each customer touch point and represent the best of the best. The Anderson Auto Group is a one stop auto sales, maintenance, and repair business for all of your automotive needs. Out of town customers will be accommodated with free shuttle service from Las Vegas and Phoenix airports and if an overnight stay is needed, discounted nightly rates are available from local hotels. We welcome you to come in and enjoy a positive buying experience and look forward to you joining the Anderson family of customers. DISCLAIMER: Prices, options, specifications and images shown are subject to certain qualifications and availability. Pricing information is not final and may not include taxes, registration, finance and purchase fees. Please confirm vehicle availability, pricing and warranty information by calling us at 928-764-2886 or emailing our internet sales department at toyotasales@andersonauto.com. Recent Arrival! Limited Grade Advanced Technology Pkg: Includes Smart Key System On All Doors and Liftgate; Height-Adjustable Foot Activated Power Liftgate with Jam Protection; Bird's Eye View Camera with - Perimeter Scan, Overhead 360 Degree View In Drive and Reverse, and Curb View; and Qi-Compatible Wireless Smartphone Charging with Charge Indicator Light. TOYOTA NEW VEHICLE WARRANTY: Every Toyota vehicle is supported by a 36-month/36,000-mile limited warranty coverage, Powertrain Coverage for 60 months/60,000 miles (engine, transmission/transaxle, front-wheel-drive system, rear-wheel drive, seatbelts and airbags) and Rust-Through Coverage of 60 months/unlimited miles (corrosion perforation of sheet metal)." WHY BUY FROM ANDERSON: Anderson Toyota is a five-time recipient of the Toyota President's Award. The award is given to dealers that excel in all facets of their operations and is recognition for dealerships that continue to go above and beyond at each customer touch point and represent the best of the best. The Anderson Auto Group is a one stop auto sales, maintenance, and repair business for all of your automotive needs. Out of town customers will be accommodated with free shuttle service from Las Vegas and Phoenix airports and if an overnight stay is needed, discounted nightly rates are available from local hotels. We welcome you to come in and enjoy a positive buying experience and look forward to you joining the Anderson family of customers. DISCLAIMER: Prices, options, specifications and images shown are subject to certain qualifications and availability. Pricing information is not final and may not include taxes, registration, finance and purchase fees. 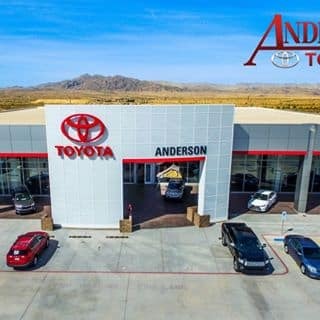 Please confirm vehicle availability, pricing and warranty information by calling us at 928-764-2886 or emailing our internet sales department at toyotasales@andersonauto.com.